Here is the simple trick to add music in your okrut profile. Step 1 : Open your Notepad. Step 5 : Goto Edit -> Select All. Step 6 : Goto Edit -> Copy. Step 7 : Open your New Orkut. Step 8 : Click on edit for about me. Step 9 : Paste there. Step 10 : Save it. You can't see anything when you paste on about me. And paste the mp3 link of your favorite music. Need music files with mp3 extension. 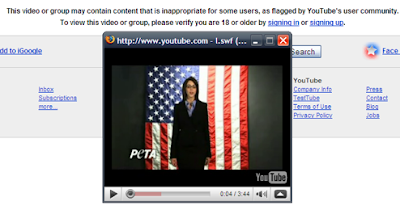 Youtube uses a flag system that allows users to report videos as inappropriate which according to Youtube means any violation of the Youtube terms of service. A flagged video will be reviewed by an administrator who has numerous options at hand including setting the flag for age verification which requires users to login before they can view the video. Age verification is pretty basic and anyone who cheated on his birthday can watch the video after logging in. Numerous ways to bypass that age verification check have been posted which included using caches and proxies. The Firefox extension "You Old Enough" provides users with another way. The experimental add-on will check if the video on Youtube is flagged for age verification and open it immediately in apopup window. You require a PC or a Laptop and Serial/USB cable OR Infrared Device OR Bluetooth dongle in order to first connect your phone with your computer. 1)First Activate Airtel Live! ( It is FREE). FIRST one as the active profile. 3)Connect your phone with your connectivity cable using blutooth dongle or usb/serial cable. 4) Go to control panel and create a new dial up connection. ISP Name : Anything you want to enter. Phone Number : Your mobile number. 6) Connect to the dial-up account. Denied…”. Keep the mobile down. press ENTER and WAIT for some minutes. 9) That’s it done ! now you can open any page on your pc for free. I hope these settings may work please let me know if you have any problem by leaving a comment here. AirTel Free Miss Call Alert ! I'm reading: AirTel Free Miss Call Alert ! Remove Password Without Current Password In XP ! Type net users and hit enter. CMD will shows the User Accounts in the system. If you want reset administrator password then type net users "administrator" * and hit enter 3 times. Now Administrator is free without password. I'm reading: Remove Password Without Current Password In XP ! Boot your XP -> [Logon screen] Press CTRL + ALT + DEL -> [Classic View of Logon Screen] User Name : administrator _ Password : [nothing] -> Hit Enter. Subject: FW: URGENT message for mobile phone users!!! URGENT message for mobile phone users!! !Please be careful and mindful! All mobile users pay attention if you receive a phone call and your mobile phone displays ( ACE ) on the screen don't answer the call. END THE CALL IMMEDIATELY if you answer the call, your phone will be infected by a virus. This virus will erase all IMEI and IMSI information from both your phone and your SIM card, which will make your phone unable to connect with the telephone network. All mobile users pay attention!!!!!!!!! If you receive a phone call and your mobile phone displays(XALAN)on the screen don't answer the call, END THE CALL IMMEDIATELY,if you answer the call,your phone will be infected by a virus. This virus WILL ERASE all IMEI and IMSI information from both your phone and your SIM card, which will make your phone unable to connect with the telephone network. You will have to buy a new phone. This information has been confirmed by both Motorola and Nokia. There are over 3 Million mobile phones being infected by this virus in all around the world now. You can also check this news in the CNN web site. PLEASE FORWARD THIS PIECE OF INFORMATION TO ALL YOUR FRIENDS HAVING A MOBILE PHONE. Variants of this hoax have been circulating since 1999. The information in the email is completely untrue and has certainly not been "confirmed by both Motorola and Nokia". If a virus had really destroyed the mobile phones of 3 million US users it would be a major news story around the world. There is nothing on the CNN site about this virus nor does a search of Google News reveal any articles that confirm the story. However, there are legitimate news articles about a real mobile phone virus that was discovered back in June 2004. This worm, dubbed "Cabir" is basically a "proof of concept" virus and does little damage. Vnunet.com reports that the first outbreak of this virus "in the wild" occurred in Singapore in early October. Although Cabir is virtually harmless, it does indicate that mobile phone virus attacks are possible and may become a significant threat in the future. News of Cabir may also be giving new life to this old mobile phone virus hoax.While mobile phone viruses are real, experts maintain that the potential threat of such viruses has been exaggerated. In any case, the information included in these emails is false and the "warnings" should be deleted without forwarding. Any "virus warnings" received via a forwarded email should not be taken at face value. Always take the time to confirm the information at a reputable anti-virus website. NOW THERE IS A VIRUS ON MOBILE PHONE SYSTEM. All mobile phone in DIGITAL system can be infected by this virus. If you receive a phone call and your phone display "UNAVAILABLE" on the screen (for most of digital mobile phones with a function to display in-coming call telephone number), DON'T ANSWER THE CALL. END THE CALL IMMEDIATELY!!! BECAUSE IF YOU ANSWER THE CALL, YOUR PHONE WILL BE INFECTED BY THIS VIRUS. This virus will erase all IMIE and IMSI information from both your phone and your SIM card which will make your phone unable to connect with the telephone network. You will have to buy a new phone. This information has been confirmed by both Motorola and Nokia. Formore information, please visit Motorola or Nokia web sites: http://www.mot.com or http://www.nokia.com . I also bid for one of those wonderfully inexpensive massive capacity flash drives and received an USB flash drive that tells me it's 8 GB. But in fact it's not. It only holds 4GB of capacity. My flash drive was labeled with an 8GB checkmark on the box and an 8GB sticker on the stick itself. Very promising. And when I plugged it in, my Antivirus program reported the virus win32:Perlovga and a Trojan-Downloader named Win32:Small-btx found in the two files copy.exe and host.exe that were both stored on the stick. The autorun.inf also stored on the flash drive tried to infect my computer system by executing the copy.exe command. My USB stick is formatted with FAT32 and is an Alcor USB 2.0 model. The product shows itself as 8GB under Windows XP. Besides, the product was advertised with a data writing speed of up to 7 MB/s. In reality it is much slower (yes I have USB 2.0 :) and writes data only with 12 MB/s (maximum). 2. Don't plug in your flash drive yet. 3. Disable the Autorun feature of Windows XP first. 4. Plug the stick into an USB port (Warning: have your Virus signatures of your antivirus program updated first, just in case). 5. Don't open anything on the stick. Do not doubleclick on the stick. 6. Format the stick to get rid of any potential viruses or malicious tools. 7. Run Bart's Stuff and select the stick under "Folder"
8. Start the test. It will write a sequential file that will fill the stick up to > 90% of it's capacity and then it does read back the written data. 9. Check the Bart's stuff status written total when you get an error message like this: "An Error occurred. WriteFile returned an Error. There is not enough space on the disk". My stick ran out of space at 4 GB exactly, Bart's Stuff filled the stick up to 52 % of it's fake capacity. But: Since the FAT32 maximum supported file size is 4GB, this method would not work on flash drives with more than 4GB of capacity. Larger size sticks should be filled up with large files that are compared against their originals to see if some errors occur. Windows XP sees it as 7.95 GB capacity with 8,539,680,768 bytes. This is too much reported space. I also own a non-fake 8GB flash drive (not an ebay deal). This real 8GB stick is reported by Windows XP as 7.73 GB capacity with 8,304,717,824 bytes. Since flash drives always give you less than the advertised storage space, this 7.73 GB seems to be about right for my real 8GB flash drive. Next step if you own a fake flash drive: If you can, file a complain with paypal to try to get your money back. There is another very useful utility that can help to check for fake USB sticks, it's called H2testw ( -- by Harald Bögeholz / c't Magazin für Computertechnik , can be be downloaded at the heise dot de download site). The readme is in German, yet the program can measure the write and read speed, too. On my fake 8 GB stick, I only get about 1 to 3 MB/s write speed which is an indication that there is something really weird going on here. the Utility sees the USB stick as 8144 MB in size when empty which is totally impossible, another hint that it was manipulated. Don't forget to delete all test data from the stick when you are done. Change the administrator password from a limited account in XP? Many people use computers with Windows XP and have limited users and they have forgot the administrator password, this article can help them find the password. f you have forgotten the administrator password for the Windows XP operating system, it would be very hard for you to login and it might become a disaster for you, because you might lose a lot of information and it might take a huge amount of time to recover your critical information. B. When reached to the login page, press Alt+Ctrl+Del buttons, A dialog box apears, in the "User name" enter: administrator and leave the password box empty, press ok! This method has always been successful for me! But to use this method you have to have a bootable Windows XP CD. C. Then while the message: “Press any key to boot from CD" appears press any button. D. When the Licensing Agreement comes - Press F8 to agree it. E. Setup screen which gives the option to do a Repair or install a new version, press repair. F. Wait the Repair finish the first step. H. Windows will start copying the files and after the copy, when the message "Installing Devices" appears in the progress bar press "SHIFT + F10" then a console opens. J. when the repair process finished you can login with the admin password. I'm reading: Change the administrator password from a limited account in XP? How to make key generators? I take no responsibility of the usage of this information. This tutorial, is for educational knowledge ONLY. simple keygen, of a program called W3Filer 32 V1.1.3. E.How to code in Turbo Pascal (tm). I'm reading: How to make keygens? 2. u understand that u r using the info here 4 yourself only nd not 4 harming anyone in anyway or invading privacy of others. It is also acknowledge that u will not using information here to do anything illegal 4 I shall not be held responsible 4 anything. It is a very good software 4 password protecting ur files , folders , drives ,programs nd 4 that matter the whole computer by www.tropsoft.com. What can this guide do 4 me ? What do u mean by "under certain condition" ? Well u can access file protected by PC Security v5.1 only when the locked file is kept in a folder which is not protected that it is u can see the file kept in a folder nd when u click the file(protected file) it gives u strange messages like " access denied "or the "file is used by another program "which tells u that the file is protected . How can I unlock files protected by PC Security nd what all do I need 4 it ? http://pc-magic.com/dl.htm if cannot install the magic folder on ur PC u need to download some dll files from above mentioned site. Now that u have installed magic folder open it nd hide (make that folder invisible )the folder in which locked file is kept nd close the program nd shut down ur computer now when u will reboot then again open the magic folders now u should make the folder that u have just made invisible visible ie. Folder that u have made invisble before rebooting the system now make it visible again nd now open the folder nd click on the file Congrats fh !! the file is opened nd now u have full access to the file. 1. U may avoid using Internet Explorer(old versions) and make the switch to Opera, it's more secure, plain and simple. 2. Get Spybot Search and Destroy or Spyware Doctor and immediately update it. 3. Get Adaware SE and immediately update it. 6. While the scans are going check your registry (Click start --> Run and type regedit to get intot he registry) and look in HKEY_CurrentUser/software/microsoft/windows/currentversion/run & HKEY_Local_Machine/software/microsoft/windows/currentversion/run. Verify that all programs listed are legitimate and wanted. 7. If or when your antivirus scan comes across anything, search for that file name in your registry and delete it, at least quarantine it. 8. Use explorer to go to the windows/system32 folder and sort by date. If you haven't already done so, make sure you can see the entire file names. click Tools --> Folder Options and unclick the box labeled "Hide extensions for known file types" and under Hidden files and folders click "Show hidden files and folders." However, make sure you choose "Hide protected operating system files" so you don't accidentally remove anything that would cripple your computer.. You are looking for recent files with names ending with .exe and .dll that look suspicious. Major culprits will have gibberish names such as alkjdlkjfa.exe. 9. Once you can get clean scans in safe mode, reboot in normal mode and scan all over again. If you can't get a clean scan in regular mode then you have something more persistant that could take more research. 10. Make sure your firewall doesn't have strange exceptions. 11. If you suspect anything that is going wrong with your computer is the action of a stalker, on a more secure system change all your major passwords, mostly bu using a virtual keyboard(to prevent keyloggers). 12. If your system has been specifically targeted and hacked you can never be 100% sure that your system is no longer compromised so start with 11, make backups of personal files on the infected system and format and re-install Windows. If nothing works, you could replace the existing BIOS chip with a new one you can buy from your specialized electronic shop or your computer supplier. It's a quick operation if the chip is inserted on a base and not soldered to the motherboard, otherwise you'll have to unsolder it and then put the new one. In this case would be more convenient to solder a base on which you'll then plug the new chip, in the eventuality that you'll have to change it again. If you can't find the BIOS chip specifically made for your motherboard, you should buy one of the same type (probably one of the ones shown above) and look in your motherboard manufacturer's website to see if there's the BIOS image to download. Then you should copy that image on the chip you bought with an EPROM programmer. Also, when you boot Windows, it may happen that it finds some new device, because of the new configuration of the BIOS, in this case you'll probably need the Windows installation CD because Windows may ask you for some external files. If Windows doesn't see the CD-ROM try to eject and re-insert the CD-ROM again. If Windows can't find the CD-ROM drive and you set it properly from the BIOS config, just reboot with the reset key, and in the next run Windows should find it. However most files needed by the system while installing new hardware could also be found in C:WINDOWS, C:WINDOWSSYSTEM, or C:WINDOWSINF . Some Toshiba notebooks allow to bypass BIOS by inserting a "key-disk" in the floppy disk drive while booting. To create a Toshiba Keydisk, take a 720Kb or 1.44Mb floppy disk, format it (if it's not formatted yet), then use a hex editor such as Hex Workshop to change the first five bytes of the second sector (the one after the boot sector) and set them to 4B 45 59 00 00 (note that the first three bytes are the ASCII for "KEY" followed by two zeroes). Once you have created the key disk put it into the notebook's drive and turn it on, then push the reset button and when asked for password, press Enter. You will be asked to Set Password again. Press Y and Enter. You'll enter the BIOS configuration where you can set a new password. Clear Cmos, jumper.That is the way how I solve problem when customer forgets password. the CMOS, make sure you hold it down till it's done booting. metallic nickel looking battery that supplies power to the CMOS. just move the black little pin cover to the opposite two pins. I don't recommend it unless you are a professional. A CMOS password, if present, is one that you must enter when the computer is booting up. It comes before a network or operating system password. You will not be able to run any programs, view files or even enter the operating system if you do not enter this password. If you find you'd like to change the password, this can be done by restarting your computer and entering the CMOS setup. CMOS setup is usually entered by typing a certain key or combination of keys as your computer is booting up. The DEL (delete) key or Ctrl/Enter are common ones. However, your BIOS should show a line explaining which key(s) to type to enter SETUP, BIOS SETUP, OR CMOS SETUP. There should be a password option in the setup program. If you are not able to find this option you will need to consult the manual that came with the computer or motherboard. If you have forgotten your password you will need to clear it by physically changing jumpers on your motherboard to short out certain pins, thereby erasing the password. The location of these pins varies from motherboard to motherboard, so you will need to refer to your computer or motherboard's manual. Some motherboards have a default password. For example, the AMI BIOS default password is "AMI". Check your computer or motherboard manual for the default password. It's worth trying this password if you don't know, or have forgotten the CMOS password. Some older computers required you to have a "reference disk" in order to make changes to the CMOS settings, which would include the password. If you can't access the computer when it's on, and the standard backdoor passwords didn't work, you'll have to flash the BIOS via hardware. Please read the important notes at the end of this section before to try any of these methods. The canonical way to flash the BIOS via hardware is to plug, unplug, or switch a jumper on the motherboard (for "switching a jumper" I mean that you find a jumper that joins the central pin and a side pin of a group of three pins, you should then unplug the jumper and then plug it to the central pin and to the pin on the opposite side, so if the jumper is normally on position 1-2, you have to put it on position 2-3, or vice versa). This jumper is not always located near to the BIOS, but could be anywhere on the motherboard. To find the correct jumper you should read the motherboard's manual. Once you've located the correct jumper, switch it (or plug or unplug it, depending from what the manual says) while the computer is turned OFF. Wait a couple of seconds then put the jumper back to its original position. In some motherboards it may happen that the computer will automatically turn itself on, after flashing the BIOS. In this case, turn it off, and put the jumper back to its original position, then turn it on again. Other motherboards require you turn the computer on for a few seconds to flash the BIOS. If you don't have the motherboard's manual, you'll have to "brute force" it... trying out all the jumpers. In this case, try first the isolated ones (not in a group), the ones near to the BIOS, and the ones you can switch (as I explained before). If all them fail, try all the others. However, you must modify the status of only one jumper per attempt, otherwise you could damage the motherboard (since you don't know what the jumper you modified is actually meant for). If the password request screen still appear, try another one. If after flashing the BIOS, the computer won't boot when you turn it on, turn it off, and wait some seconds before to retry. If you can't find the jumper to flash the BIOS or if such jumper doesn't exist, you can remove the battery that keeps the BIOS memory alive. It's a button-size battery somewhere on the motherboard (on elder computers the battery could be a small, typically blue, cylinder soldered to the motherboard, but usually has a jumper on its side to disconnect it, otherwise you'll have to unsolder it and then solder it back). Take it away for 15-30 minutes or more, then put it back and the data contained into the BIOS memory should be volatilized. I'd suggest you to remove it for about one hour to be sure, because if you put it back when the data aren't erased yet you'll have to wait more time, as you've never removed it. If at first it doesn't work, try to remove the battery overnight. Important note: in laptop and notebooks you don't have to remove the computer's power batteries (which would be useless), but you should open your computer and remove the CMOS battery from the motherboard. The Dallas DS1287 and DS1287A, and the compatible Benchmarq bp3287MT and bq3287AMT chips have a built-in battery. This battery should last up to ten years. Any motherboard using these chips should not have an additional battery (this means you can't flash the BIOS by removing a battery). When the battery fails, the RTC chip would be replaced. The 1287 (and 3287MT) differ from the 1287A in that the CMOS RAM can't be cleared. If there is a problem such as a forgotten password, the chip must be replaced. (In this case it is recommended to replace the 1287 with a 1287A). Also the Dallas 12887 and 12887A are similar but contain twice as much CMOS RAM storage. Short pins 12 and 24. These are the pins on diagonally opposite corners - lower left and upper right. You might also try pins 12 and 20. If you have access to the computer when it's turned on, you could try one of those programs that remove the password from the BIOS, by invalidating its memory. Note that the first letter is a "O" not the number "0". The numbers which follow are two bytes in hex format. Note that the key associated to "_" in the US keyboard corresponds to "?" in some European keyboards (such as Italian and German ones), so -- for example -- you should type AWARD?SW when using those keyboards. Also remember that passwords are Case Sensitive. The last two passwords in the AWARD BIOS list are in Russian. Imagine ur cell battery is very low, u r expecting an important call and u don't have a charger. Life timer (W A R 0 A N T Y) - The amount of time your phone has spent sending and receiving calls. Restores phone to as if it was out of the box. Retains firmware version and operator Variant changes but wipes all applications you have installed. Does not format the memory card so any apps on there may reinstall once powered back up again. Power off phone. Press and hold Green, * and 3 and keep them held whilst powering on and for a few seconds after. Resets all settings to defaults but keeps any applications you have installed and photos etc. Both need the Security code, which, by default, is 12345. #: Switches between General and Silent modes - not supported by all Operator Variants (when composing messages will switch between character and number input when held down) 12# (etc) in standby will dial the number held in location 12 on your SIM address book. These are Nokia 1100 unlock codes. Using these mobile unlock codes for Nokia 1100 you can see the secret Nokia 1100 codes. Nokia 1100 can be master reset and the serial number for nokia Nokia 1100 can be easily identified. The free unlocking for Nokia 1100 is easy and simple to use. Hope you enjoy the secret codes for Nokia 1100. THe Nokia 1100 is a phone popular Phone and used around the world. The Nokia 1100 come with a lot of features and few of secret codes can make your Nokia 1100 more functional more fruitful. The last two digits are the year. If the year is 95, the first two digits are the month. For 96 the first two digits are the week of the year. 'Y' has to be 1,2,3 or 4 - depending of what lock you what to deal with. 2. Turn on the phone and press the UP VOLUME key for 3 sec. Then release it and the phone says PIN CODE? 3. Press the "C" key. These codes for the Nokia series of phones provide some interesting information for users, they also unlock some hidden functions. These codes are often referred to as “Nokia Secret Codes” or “Nokia Hacks”. Use the codes at your own risk, not all Nokia phones support all codes. *4720# (*hra0#) Cctivates Half Rate, Half Rate is 5.6kbit/s and uses half the bandwidth at the cost of call quality. Network operators often activate half rate on overloaded towers during peak times to save costs. · Name the shortcut as "Don't Click Here" and click the "Finish" button. · Move the shortcut into "C:\Documents and Settings\All Users\Start Menu\Programs\Startup". Restart your computer and see the magic, the system will automatically shutdown when turned on. automatically power down/shut off without pressing the power off button on the computers unlike in Windows Me/95/2000. For some reason, Hibernate isn't available from the default Shut Down dialog in XP. But you can enable it simply enough, by holding down the shift-key while the dialog is visible. disk space equal to your RAM. C-drive called hiberfil.sys, hibernation is enabled. Transfer) running in the background. · Click on Start->Run, type 'msconfig', then click 'OK'. This Works For XP, Vista, AND Windows 7. Do you hate that evertime you create a new icon on the desktop, most of the time, you can’t see it because of that STUPID shortcut arrow on it! Well not anymore! All this takes is a little registry editing. Step 3: A whole bunch of files will appear, scroll down to the L’s until you see on called lnkfile and click on the folder. Then, the box will show files in it on the right, and even one that says IsShortcut. Right click it, and delete it. Go to your desktop, and right click it. Then your files that have the shortcut icons on it will not have them, if it doesn't works restart your computer! HERE’S A WAY I FOUND TO DELETE THE MY DOCUMENTS FOLDER OF UR ENEMY OR JUST 4 FUN. HERE’S WHAT U SHOULD DO. 1. Open any video which you want to download from youtube. 2. Type voobys instead of youtube in browser. Change part is in red colour. 3. Click on download button. same page and convert it into .3gp, .avi etc format. http://www.voobys. com/software/ download. php this link. Let me know if you want any other information regarding this. Insert your name in the bottom right taskbar! here u can see A.M. and P.M. change it with u r name or anything you like! I'm reading: Insert your name in the bottom right taskbar! 1) Boot up windows.2) go to dos-prompt or go to command prompt directly from the windows start up menu.